I am obviously having issues with my blog today! Yikes. I cannot find the issue (I'm not a coding whiz) so maybe now it's time to move to WordPress anyway! Hopefully, you'll see something tomorrow. And maybe it'll even be "purdy." For now, read my feed. Or feed my read. No, the title is not about another stock market crash - it's about crashes in the past. This one is a one-pager about the Nikkei Index collapse that began in the early 1990s. I remember being in college at that time, and the Japanese stock market was going absolutely nuts (on the bullish side). I think it got to nearly 40,000!!! Only to fall to less than 10,000 and stay there for over 15 years! Humans aren't very good at learning from our mistakes. In fact, it's highly likely that we'll repeat them again and again. Often times, we make the same mistakes over, but bigger and more catastrophic. 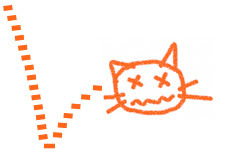 Bull Market or Dead Cat Bounce? The stock market has rebounded quite well since it hit the 6,000 range (Dow). The question is, will the rise continue, or will it stall. OR worse yet, is this the classic "dead cat bounce?" It all remains to be seen, of course. Too soon to tell. But I'm going on record to say that this, even with today's announcement by the Fed that it's officially fueling inflation by printing money, is not a dead cat bounce. Oh, the market may tumble for a few days. But I think we've bottom. Just note that the bottom of the ocean has peaks and valleys, too, and that we might see 6,000 again. We may be here a while. But we're not gonna go any lower than 6k. In fact, it is my gut feeling that we're on the upswing. I believe the end of this decade and the first few years of the next decade will be banner years for stock markets all across the land. After all, we're at levels here in the US that we haven't seen since the mid-90s. The housing, credit, and mortgage messes weren't even in place then. As for the stock market as a whole, I continue to view the market as undervalued, but not deeply undervalued. So over the course of a 7-10 year holding period, I do expect passive buy-and-hold investors in the S&P 500 to achieve total returns somewhat above 10% annually. Shorter-term, however, investors may demand much higher prospective long-term returns in order to accept risk, and that's a problem, because the only way to price stocks to deliver higher long-term returns is to drive prices lower. After all, even a dead cat will bounce. Welcome to the March 18, 2009 edition of Kids and Money. There were a lot of good posts. There were a lot of "spammy" posts, too, which I deleted. Remember, folks, I approve 99% of the posts here, but this week I probably weeded out 30-40 percent. That's way too much. So, please, let's keep this focused on Kids and Money. Not Kids OR Money. But Kids AND Money and how the two are inter-related. Okay? KCLau presents Learn Money Tips playing iMafia posted at KCLau's Money Tips, saying, "About iMafia, an application for iPhone. How it is connected to real life in terms of personal finance and how to play the game." jim presents Teaching Kids About Money: Tessy and Tab Money Manager Kit posted at Blueprint for Financial Prosperity. The Smarter Wallet presents Blu-Ray DVD Player Review: Pros and Cons posted at The Smarter Wallet, saying, "Are blu-ray players worth the money? Should you get one for your family?" Julie Guarnizo presents Teaching Money Management Habits to Children posted at Beef Up Your Piggy, saying, "As a mother of two small children, teaching life lessons about money and personal finance is crucial is raising children." David presents The Safety of Your Accounts posted at Personal Finance Ology, saying, "With the uncertainty in the banking industry, learn where the safest places for your money are!" Nate Desmond presents 12 Ways to Waste Money in College posted at Debt-free Scholar. Steve Patterson presents ISMagazine.com - Blog - ATM Skimming Leads to 1 Billion in Losses for Consumers posted at ISMagazine.com, saying, "Great story about ATM safety and something to present to your bank to make sure their ATMs are safe." Debbie Ducker presents Your Children and Grandchildren Must Learn to Save Money posted at Ducker Promotion Ezine, saying, "Teach your children how to save money at an early age and you will save them a lifetime of heartache." Justin Hall presents How to Find a Job posted at Justin Hall. Patricia Turner presents The Ultimate Guide to Ponzi Schemes: Oldest and Biggest Scams, Madoff and More posted at Bankling. Stephanie presents The Wii Fund posted at Stop the Ride!, saying, "Teaching the kids to save." jim presents Deducting Miles for Charitable Volunteering posted at Blueprint for Financial Prosperity. Matt Sherberg presents Choosing the Best Debt Solution posted at Debt, saying, "When you have mountains of debt piling up and you have debt collectors waiting at your doorstep, it is time to get off the couch and find a debt solution that will work for you. The right debt solution can help you reduce your debt." Jeff Rose presents 29 Good Reads About Kids And Money posted at Jeff Rose. Savings Toolbox presents The UnTruths About Saving For College posted at Savings Toolbox. Silicon Valley Blogger presents College Advantage: Ohio 529 Savings Plan Offers $25 Cash Bonus posted at The Digerati Life, saying, "529 plan for your kids!" The Smarter Wallet presents Budget Your Money and Control Your Spending Using This Simple System posted at The Smarter Wallet, saying, "Thanks!" Sam presents NEW !! Job Interview Tips and Questions. Get the Job You Want. Job Interview Tips and Skills. ! Surfer Sam posted at Surfer Sam and Friends. Dating321 presents Breaking Up Tips posted at Free Dating Advice, saying, "Breaking up is difficult to do, but it is important you go about in a mature and respectful way." What Really Caused the Recession? I've seen a lot of stories about what caused the Mortgage Meltdown, the Credit Crunch, and the recession (some are even calling it a depression). On the drive in today, the REAL answer finally came to me. As in all complex things in life, there wasn't one specific cause. Here's my general thought process on this topic. People who want to get to the root of any cause always use a root cause analysis to determine the true cause of any issue. One of the practices that process improvement folks use is the fishbone diagram, where if you keep asking "why?" to a question you'll get to the root of it. But this simple approach often neglects the contributing factors to an issue or a failure. For example, a barn might have caught fire and burned to the ground. The root cause might have been determined to have been a spark from a passing-by freight train. But the contributing factors were that there was damp hay in the barn, along with kerosene, dry timber, a poorly-maintained exterior, and weeds that had grown rampant over the course of several years. All of these things led to the fire. Of course, the fire could not have started if not for the spark. But the weeds, hay, timber, etc. allowed the fire to spread at such a rate that the fire crew could not stop it before the entire barn burned down. Such is the case with the economy. There were many contributing factors: Declining home values, rising bad debt, companies trying to stay afloat cutting staff, phoney financial instruments dreamed up by mathematicians rather than business folks, etc. The list is literally endless. But what was the root of it all? As in any mania, it was the madness of crowds. Adam Smith's "invisible hand" and "pursuit of self interest" was the downfall. Home buyers thought, "If I don't buy this house now, somebody else will." Lenders said, "If I don't fund this mortgage, somebody else will." Insurers surmised, "If I don't insure this asset, somebody else will." If I don't _____ this, somebody else will! It was all about getting "it" before somebody else got "it." Or, in other words, what I call "relative greed." You get a 10 percent pay raise. Your neighbor gets a 15 percent pay raise. You get a 5 percent pay raise. Your neighbor gets nada. Do you know which one most people would take? Yeah, #2. It's getting "more" than your neighbor, co-worker, competitor. That's what happened here, in my humble opinion. It's also "the market" filling in voids. If Bank of America doesn't do this mortgage, Wachovia will. And Wachovia did. And did, and did and did and did. BofA saw this and said, "We're losing market cap. And we're the biggest and baddest bank around." So, they got into the game, and then some! People did it, too. If I don't buy a house now, I may never be able to afford one. "Investors" did it, too. If I don't buy this duplex now and flip it, I may never get another golden opportunity like this. Do yourself a favor: Read Extraordinary Popular Delusions and the Madness of Crowds You only really need to read any one of the stories. They're all the same, really. Market goes up and up, creating self-fulfilling prophecy. Something happens. Market goes down and down, creating self-fulfilling prophecy. What stops it? Who knows? You get the point? People are scared out of their freaking minds, and why? Because we've been led to believe that the end is near, that "it's going to get worse before it gets better" (it is, but people just hear the first part), that nobody is lending, and that your house is worth less (some hear "worthless" and walk away). It's all a part of the business cycle. The economy has ups, and it has downs. Unfortunately, when excesses take place, the business cycle fluctuations are always more extreme than they need to be. Larry Summers, President Obama's chief economic advisor, had this to say about the current economic atmosphere, and what SMART businesses (are there any left? Of course there are. They just don't make the news) should do to take advantage of this truly once-in-a-lifetime opportunity - indeed, EVERYTHING is on sale right now. Prudent businesses and individual consumers can make out like bandits right now. Except it's all legal (unlike "banditry"). Did you read that? This guy is one of the smartest people on the planet and he's a consummate economist. Folks should heed his advice. The only things missing from the Obama camp is a task force and a marketing campaign. Economics really is nothing more than "mass psychology." Right now, the patients (us) are suffering from depression, fear, anxiety...we need to hear that things will get better, sooner rather than later, and that we'll all come out of this fine. We WILL come out of this, bigger and better than before. However, many of us don't believe it. But believe it we must. The Bernard Madoff scandal is making the news again today. I haven't written much about financial scandals, rip-offs, and white collar crime, so now's as good a time as any, I suppose, to fill you in on a few things. First off, let's just say that Bernie Madoff is a jerk. He took people's money in an elaborate Ponzi scheme and made off with BILLIONS. Gone are the days when MILLIONS of dollars ripped off will make the news circuit! Madoff simply needs to be tried, sentenced, and forgetten about. "Investors" - you will NEVER get your money back. I put "investors" in quotes because a lot of those folks weren't investors. They were rich dreamers who wanted even more money than they already had. They had an "In" to a supposedly too-good-to-be-true financial "system." If it's "too good to be true," it's too good to be true! Run - don't walk - away from stuff like this. For as long as man has lived, there have been schemes concocted by shrewd, yet immoral and dispicable, people that seek to separate YOU from your MONEY. The most famous, of course, was made famous by Italian immigrant, Charles Ponzi. He promised "investors" a 50 percent return on their money in a matter of days and he made good on his promise. He took new investor money and returned it, plus the 50 percent, to the gullible folks who gave Ponzi their money first. The last suckers got the shaft. Of course, Ponzi went to jail and died poor. Just like Madoff ought to. The aforementioned, "If it's too good to be true" lesson. Invest like Warren Buffett - if you don't understand a "business," don't invest in it. Ponzi had no business other than taking people's money for himself. If you hear about a scheme on a golf course, get in your golf cart and go home. Secure your money. Make sure your pockets weren't picked. If it sounds like an "insider's secret," treat it as such. Insider trading is illegal for many reasons. Invest in YOUR own business. Nobody else gives a damn about you or your financial plight. One last thing: There are legal Ponzi schemes, the most notable of which is Social Security. Yes, you read that right. It's a government-enacted program that is exactly a Ponzi scheme. The reason that Social Security will go broke is that there are fewer and fewer "new investors" and the old investors want their guaranteed returns. I'm not making any moral judgements here. In fact, I support Social Security. In its original fomulation, it was to be used as a social safety net that had more new investors than old. As long as that was the case, the system was sound and good. But now that the demographics have turned upside down (many more collecting nowadays, not as many contributing, relatively speaking), the system is in peril. Stay tuned for my solution to the Social Securty nightmare in a coming post. And don't get me started on Medicare! It's in a much more precarious state than Social Security ever will be, but you don't hear much about it. That's my "bold" prediction. The basis for this? The increased FDIC insurance on bank deposits of $250,000 laspes on that date, as if everything will be fine by then. Don't count on it! There's a lot more downside to this economy, I'm afraid. But now might be a great time to get your ducks in a row and be ready for the upturn. It will happen just as things look their worst. Trying to serve up some worthwhile ads from entities other than just Google. Google is okay, but QuickAds supposedly serves better ads (that you may want to read), from more partners, with higher payouts! This - Gas Prices Are Not Tied to Oil Prices - BusinessWeek - is a great primer on the interaction between the price of oil and gasoline are inter-related - or not! It's a great read and simply points to the fact that our world is very complex. One would think that if something were made of oil (like gasoline), its costs would rise as oil rose in price. But this is not necessarily the case. First off, what is the "price of oil?" Is it oil from Saudi Arabia, Texas, Oklahoma, Venezuela, Mexico, Canada (the list is nearly endless)? Read the whole thing here - Gas Prices Are Not Tied to Oil Prices - BusinessWeek. Welcome to the March 2, 2009 edition of Kids and Money. It's been a while since our last carnival, so this is a BIG ONE. I've tried to put the submissions into logical blocks for easier reading. Tisha Tolar presents Work at Home Discipline: Find Some posted at Empowering Mom. jim presents Ten Recession-Busting Money Tips for Young Professionals posted at Blueprint for Financial Prosperity. Pinyo presents Where To Sell Used Books And Textbooks posted at Moolanomy. Matthew Paulson presents 8 Money Saving Ideas for Family Fun Night posted at American Consumer News. Gary R. presents Traditional vs. Rustic Camp Sites posted at Camping Tips, saying, "An increasing number of campgrounds are offering visitors the choice of both traditional and rustic campsites." Madison presents Money Saving Tips for Kids on Valentine’s Day posted at Kids and Money. Silicon Valley Blogger presents Lower Your Car Insurance Rates! How To Cut Insurance Premiums In Half posted at The Digerati Life, saying, "If you've got kids, driving safely and carefully is a must. And doing so will most likely lower your car insurance rates as well." Annette Berlin presents Printable Toys For Pre-Teens posted at Craft Stew, saying, "Older children get tired of toys fast. Rather than spending a small fortune to keep them constantly satisfied, let them create their own playthings from cardstock and a printer." jim presents How to Strong Arm Your Way to a Better Deal posted at Blueprint for Financial Prosperity. Savings Toolbox presents Tips to Save On your Summer Getaway posted at Savings Toolbox. Deposit Accounts presents Savings Accounts for Children posted at Deposit Accounts. retirehappy presents Warren Buffett’s Metric Says BUY! posted at My Retirement Blog. Carrie presents Learning About Investing as a Child posted at Less is More. RJ presents The Case for Investing in Index Funds posted at Our Financial Planner, saying, "No matter the age and experience, index funds can be your greatest friend. Thank you for hosting." Kelly Sonora presents 25 Forex-Related Twitter Accounts Worth Following posted at Best Forex Brokers. Len Penzo presents Using a Ledger to Teach Kids Money Management posted at Len Penzo . Com, saying, "Even kids as young as 6-years old can learn personal finance management skills via this simple bookkeeping plan." Lisa Mitchell presents Teaching Your Children About Money posted at Let's Talk Babies. Jacquelyn presents The Wise Parent & Child Money Guide posted at WParent.com - Wise Parenting Guide, saying, "Give your child an introduction to the subject of money by reading this article together. This will give your child a general idea about money." Finance Tips 101 presents Drowning In Debt? Bad Credit Loans May Need To Be Considered! posted at Finance Tips 101. Astrid Lee presents Suze Orman posted at World Healing, saying, "Article on advice by Suze Orman, the popular TV adviser on personal finance and about how get out of debt. Article also contains video show where she talks about how to determine how much to give to charities..."
Finance Tips 101 presents Cash Back, Award Points, and Gas Cards posted at Finance Tips 101. Madison presents Midwestern Disaster Area Tax Impacts posted at Tax Gab, saying, "Expanded college tax credits for those affected by the storms last year." The Smarter Wallet presents Student Loan Programs To Pay For My College Tuition Costs posted at The Smarter Wallet, saying, "Thanks!" Madison presents Ohio 529 College Advantage $25 Sign Up Bonus posted at My Dollar Plan. OnlineCollege presents Choosing a College: A Simple Guide for Undergraduates posted at Universities and Colleges. Concerning Kids presents Choosing The Right Pediatrician For Your Baby posted at Concerning Kids. Madison presents Our Family is Expanding… Financial Resources for Babies posted at My Dollar Plan. Pregnant Woman presents Identical Triplets - Three Bundles Of Joy posted at Pregnancy, saying, "Triplets occur in one of every eight thousand live births"
The Smarter Wallet presents Will The Obama Economic Stimulus Check and 2009 Stimulus Plan Save The Economy? posted at The Smarter Wallet, saying, "How will your family be affected by the stimulus bill?" Brian McKay presents What's in the Stimulus Bill for You? posted at MonitorBankRates.com, saying, "We have listed all the benefits for individuals in President Obama's stimulus bill that was just passed." KCLau presents Money Tips Group Writing Project posted at KCLau's Money Tips, saying, "Calling out for contributors to an e-book about personal finance." nickel presents Should You Pay Your Kids for Good Grades? posted at fivecentnickel.com. Money Tipper presents Bring Proof of Age When Flying With Young Children posted at Money Tipper. Relax presents The happy way to spend money posted at The Wise Curve, saying, "we are happier when we spend money to gain experience than buying material goods"
Concerning Kids presents Helping Your Healthy Child Stay Fit For Life posted at Concerning Kids. Other than that, I am totally speechless. I know, you're surprised. Perhaps when I pick up my jaw from the floor, I'll come back with commentary.